Losing weight and eating desserts seems like a paradox. However, the Zone Diet attempts to change this contradictory relationship by offering dessert recipes in its diet program. Dr. Barry Sears, author of The Zone, has developed a popular weight loss plan that offers Zone-friendly recipes, desserts included. As with any successful, long-term weight loss program, severe restriction of any food is not a requirement. The following dessert recipes will help you with sticking to the Zone guidelines, as well as enjoying your cake too, guilt-free. Heat oil and sugar in skillet pan over medium-high heat, stirring constantly to dissolve sugar. 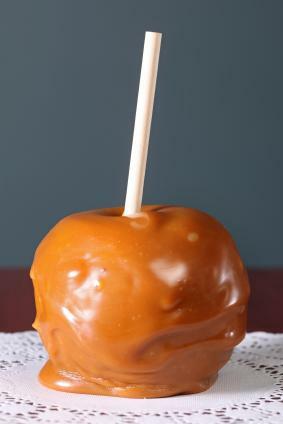 When sugar is completely dissolved, add apples, allspice, cinnamon and nutmeg; stir to coat apples thoroughly. Stir in 2 tbs. of the water; cook until apples are lightly browned on all sides. Place cottage cheese in four servings plates. Top with cooked apples. Add remaining water to skillet and cook over high heat, stirring constantly, until a thin syrup is formed, about 3 minutes. Pour syrup over apples and serve. Note: If desired, peaches can be substituted for the apples. In medium size saucepan, mix together gelatin and water. Cook over medium heat, stirring constantly, until gelatin is completely dissolved. Add kiwi, strawberries, blueberries, grapes and extracts to pan; simmer while gently stirring until raspberries soften and dissolve, about 10 minutes. Pour fruit liquid into an 8" baking pan and let cool until firmly set. Sprinkle evenly with walnuts and serve. Cut the two melons in half. Using a melon baller, cut melon flesh, leaving a thin border wall inside each melon half to be used as bowls. If necessary, cut the bottom of the halves to stay in place. Place cottage cheese in mounds in the center of each melon bowl. Combine peaches, oranges, and cherries in a large mixing bowl. 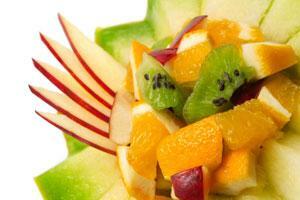 Divide fruit evenly into the four melon bowls and top each with 1 tsp. of almonds. Just because you are on a diet does not mean you need to forego dessert. With these recipes, you'll be able to stay on plan and still enjoy something sweet.